If you’re determined to make the festive season extra special for your loved ones this year by getting them gifts which are a little more imaginative, you should check out the great Christmas present ideas at Etsy. Instead of buying the same gifts every year, why not treat them to something a little more out of the ordinary? This is easy with Etsy as they offer unique, handmade and creative options you will not find anywhere else. If you’re tired of buying them socks, toiletries or a book you know they will probably never read, everything available on the global marketplace is either designed, made or curated by talented, creative sellers who have their own small businesses. Whether you are thinking of fashion, entertainment or homeware items, you can be sure of finding something which will put a smile on someone’s face this Christmas. No matter who you are buying for, we have come up with some superb gift ideas, so keep reading and buy something they will love. Thanks to our fantastic cashback deals, you will be able to save yourself some money into the bargain too. 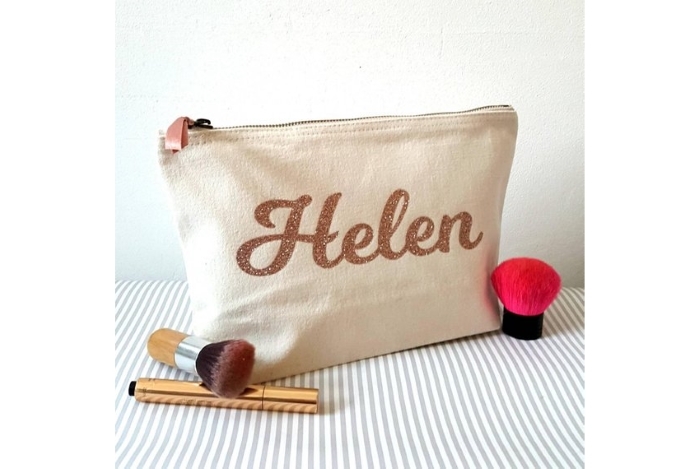 For Her: Large Personalised Make-up Bag. Price: £9.95. If the lady in your life loves to look her glamorous best all of the time, you can help ensure she dazzles wherever she goes with this sparkling gold and glitter make-up bag. Large enough for all of those essential cosmetics, this bag is available in cream or black and will feature the recipient’s name in gold or rose gold glitter lettering. Available from handmadebydebmac, the bag is made from sturdy natural cotton canvas and is finished with a metal zip. For Him: Leather Bottle Holder. Price: £22. If your man loves to relax with a beer, you can make sure he always has one with him thanks to this genuine leather bottle holder from BengiyMinu, which you can personalise with their initials or up to six letters and numbers. 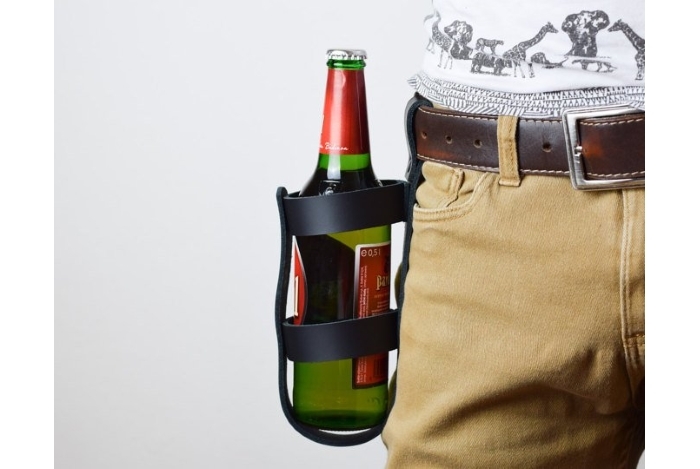 Whether he is in charge of the barbecue, mowing the lawn or doing a spot of decorating, he can always have a bottle handy as the holder can be attached to a belt. 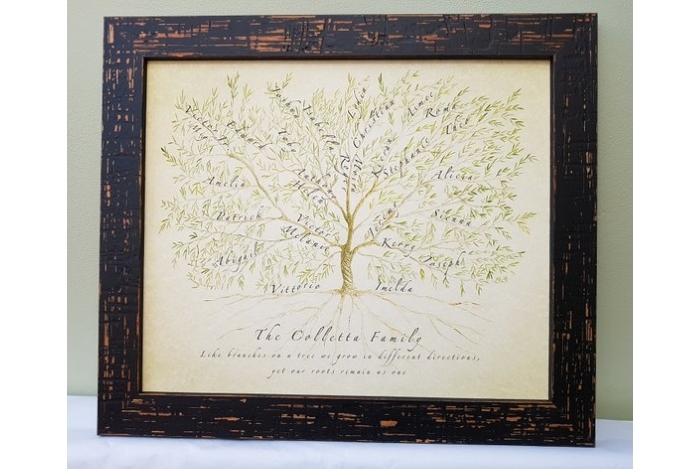 For Mum: Family Tree Framed Custom Genealogy Chart. Price: from £85. Christmas is a time for family and you can show your mum just how much she means to hers with this great gift, to which you can add up to 50 names. It features a print of a watercolour and pencil drawing of a tree, which names will be added to logically, flowing from generation to generation in family groups, with children branching off from parents. It is presented in a shabby chic distressed black painted wooden frame, handcrafted and made in the UK. You will also be able to add a message or verse beneath the tree to make this HallelujahTree item even more personal. For Dad: Docking Station. Price: £28.20. 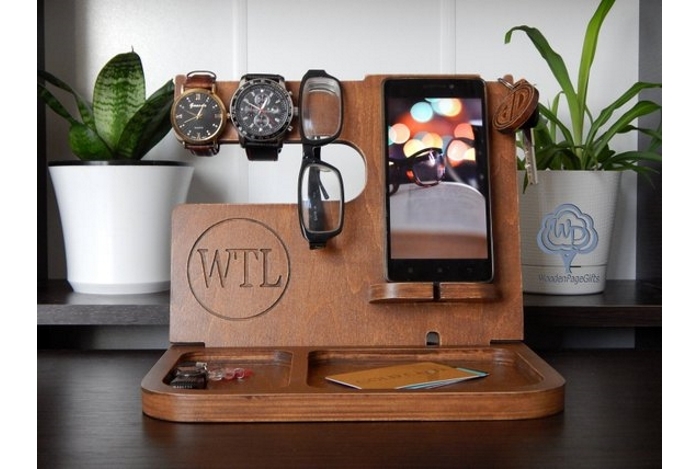 If your dad is constantly losing his keys, glasses or phone, this handy WoodenPageGifts docking station will ensure he always knows where everything is. With a section to hang his watch on and handy trays for his wallet or loose change, it will be his go-to organiser for keeping all of those essentials to hand. Handmade to order using wood and plywood, this will look stylish on dad’s desk or bedside table. For Grandparents: Heart-shaped Photo Collage. Price: £15. Share some treasured memories with your grandparents this Christmas by treating them to a personalised heart-shaped photo collage made up of your favourite images of you or you and them together. 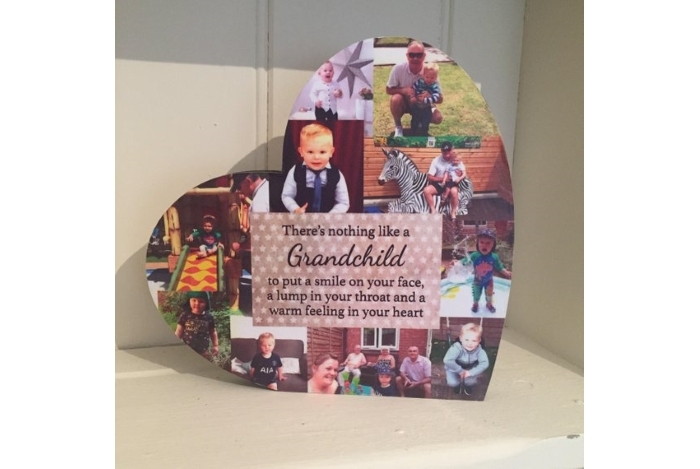 As well as being able to include 8-10 photos, the collage, from HandmadeHeavenByAmy, will also include the quote: “There’s nothing like a grandchild to put a smile on your face, a lump in your throat and a warm feeling in your heart.” The large freestanding photo heart is 20cm. 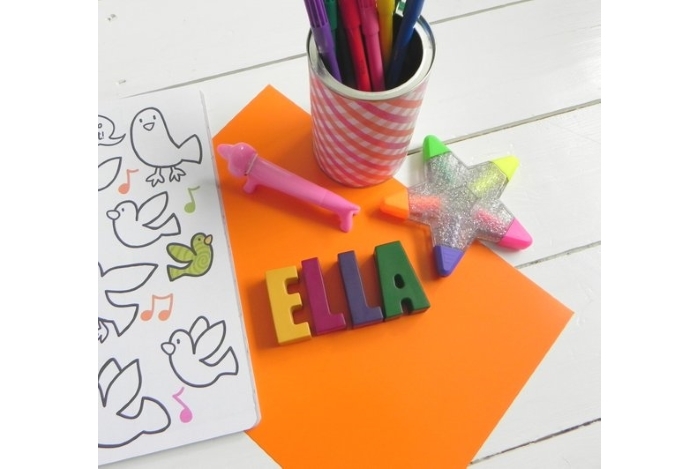 For Kids: Personalised Name Crayons. Price: From £2. If your child loves to draw and you are searching for the perfect stocking filler, these name crayons could be a perfect choice. You can choose just one letter or opt for as many as 12 but, however many you choose, your little one will be getting their hands on vibrant Doodleland Crayons which will not only make colouring fun but will be educational too. They will help them spell their name and learn the alphabet, as well as improve colour awareness and hand-eye coordination. They are not suitable for children under three. For Pets: Pet Gift Hamper. Price: £14.99. It is not only humans who enjoy getting spoiled at Christmas — it is a time for giving your pets a little extra love too. 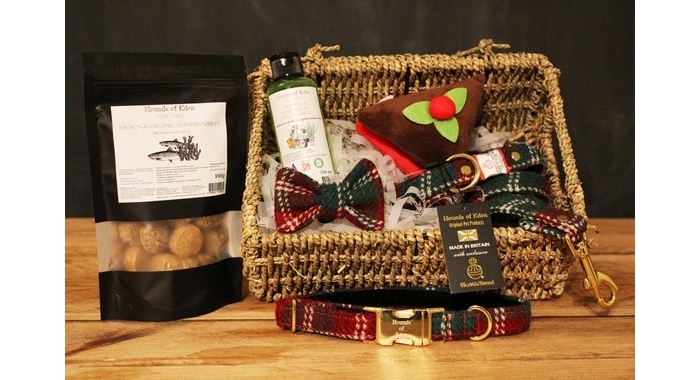 Choose a pet gift hamper from HoundsOfEden and your pup will receive a natural seagrass hamper, ideal for storing their toys or snacks, one of five varieties of natural dog snacks and dog toys, plus one of two varieties of doggy shampoo. This can be added to any combination of dog collar, lead and/or bow to make the perfect gift. All of the items will arrive pre-packed in the hamper, which will be finished off with a festive red ribbon. Whatever you are thinking of buying from Etsy, don’t forget to earn yourself some cashback with our fantastic deals.